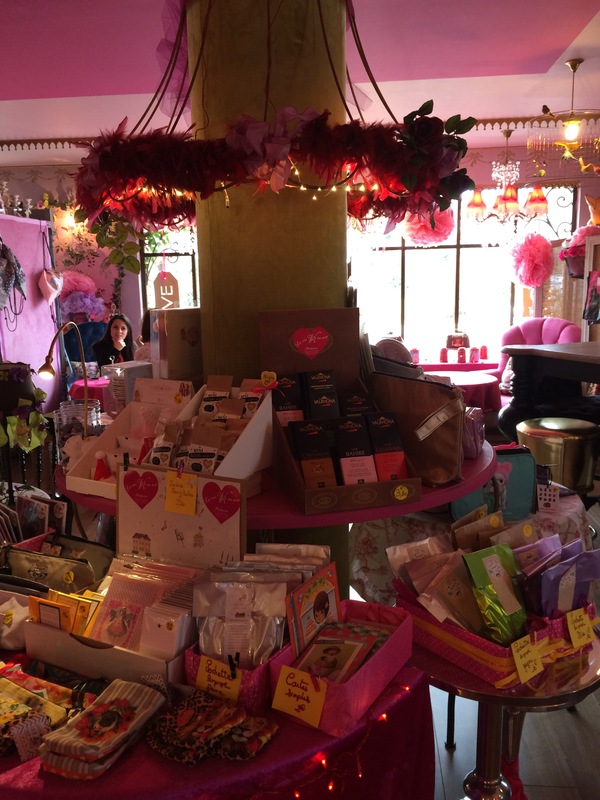 I make no bones about it – I love a good coffee stop and La Vie en Rose at Coustellet has to be one of my favourites. The tea shop isn’t exactly in a perfect location as it’s situated on the side of the road just behind Super U in the village, nor is it in a traditional Provençal building, worthy of being on the front of a chocolate box. In fact, on the face of it, there’s little reason for you to even give it a second glance, apart perhaps from the (often decorated) large chandeliers in the windows and eye-catching window displays. The minute you open the door though you step into a different world, full of colour & quirky touches that led to my youngest son describing it as ‘like having fallen down the rabbit hole & being at the Mad Hatter’s Tea Party’. 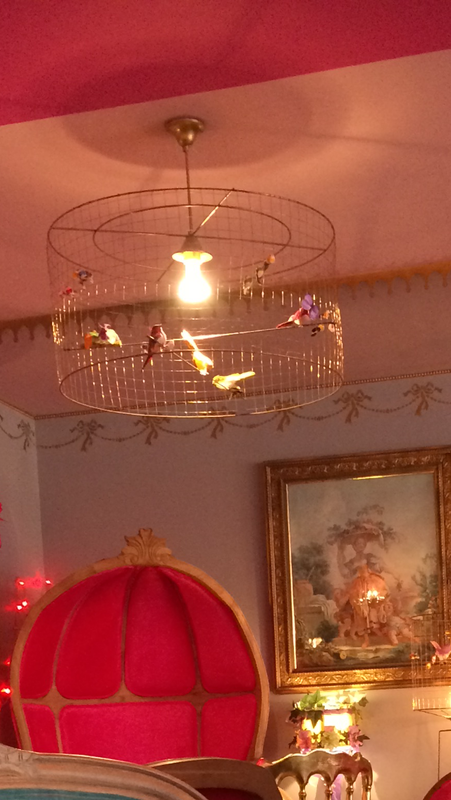 The space has soft green walls and a bright pink ceiling hung with lights decorated as if they are bird cages…..
Three columns are fitted with shelves and topped with huge wire ‘lampshades’ decorated with red feather boas and pink chiffon bows…. 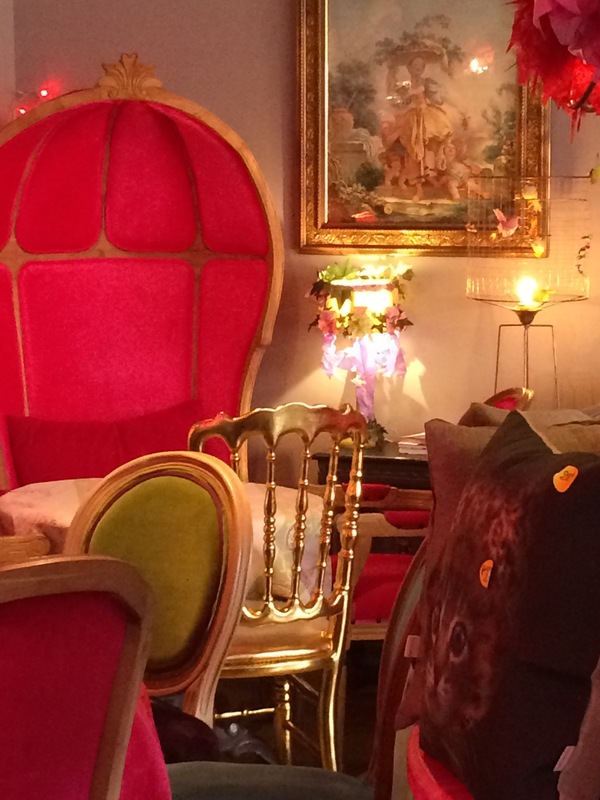 It’s fair to say that there’s an eclectic mix of furniture in bright colours including comfy sofas and incredible high backed chairs ….. 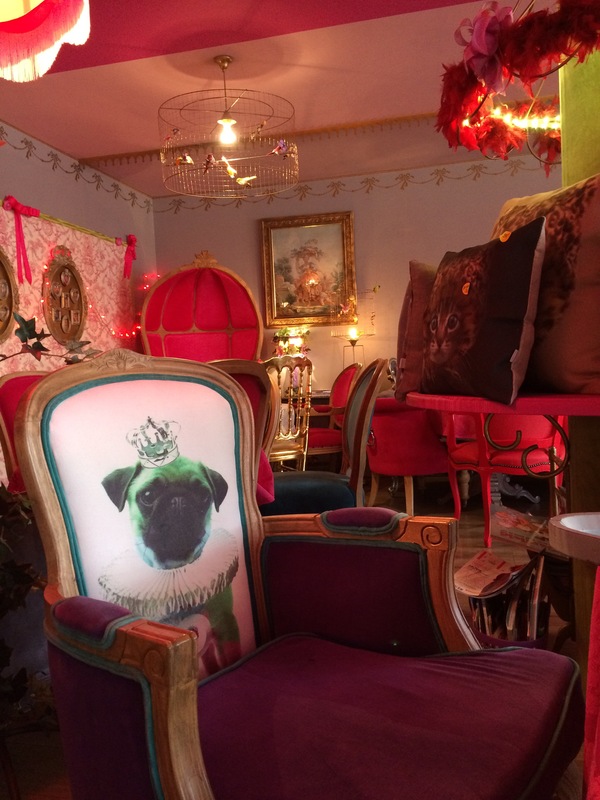 Together with others that have been upholstered with Pugs in crowns…. It’s certainly not restrained & could never be described as shabby chic as it is simply just fun, bright & above all welcoming. I first came here in the summer, parking my bike, Miss Daisy, by the olive trees in their tubs & taking a seat in the shady ‘bower’ that’s created outside in high season and very quickly it became one of my regular stops for tea & cake to fuel my rides, perfectly placed right by the cycle route (Veloroute du Calavon). What I didn’t realise, until very recently, is that La Vie en Rose seems to be one of THE places to go to for afternoon tea. A neighbour took me there last week for my birthday and at 3pm (on a Wednesday afternoon) it was full to bursting, with people tucking into their patisserie & chatting ’20 to the dozen’ over their cups of tea, happily we managed to get the last table and minutes later people were waiting for a space to appear. It was so different to my mid-morning stops when I’ve often been there with just one or two other customers and it was great to see such a lovely local business thriving. More than once in the summer, by the time I arrived, the water in the bottles on my bike had heated up to almost ‘tea-brewing’ temperature & they offered to refill them with chilled water & ice, which was so lovely and at least meant they didn’t get back to ‘almost boiling’ for a few miles more than would otherwise have been the case. I now look forward to the days when a cycle route takes me to their front door, the coffee is good and the tea comes in porcelain cups with a timer to make sure it’s perfectly brewed and did I mention the cake? Vintage porcelain cups & a tea-timer to guarantee the perfect brew! Of course you don’t have to sit in to eat – there are regularly people carrying out ‘ribboned’ boxes containing purchases for later and I’m sure they’ll be doing a roaring trade over the next few days with their range of ‘St Valentin’ cakes, like these meringues. Valentine meringues & ‘Eat Me’ is just so Alice in Wonderland! La Vie en Rose lives up to its name, every effort has been made to make it bright, quirky & fun ……..even the sugar cubes are delicate pink roses! Even a breakfast stop is an experience! Absolutely lovely! I must try that heart-shaped cookie. It’s delicious and a perfect texture – nicely chewy & not at all crumbly, but the cakes are also superb! So much choice! Have to add that in my long life so far I’ve never ever been to a place where tea was served with a timer…. This is truly über-wonderful!!!! … incredible 🙂 I’m enchanted! Imagine that! I get so distracted by Super-U that I’ve missed this fabulous place – but no more. Re-schedule my weekly shop to have tea instead of rushing past. Thanks for the heads-up!